This book is your introduction to to physical computing with the Arduino microcontroller platform. No prior experience is required, not even an understanding of basic electronics. 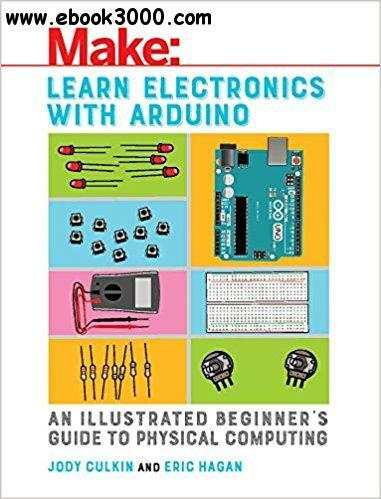 With color illustrations, easy-to-follow explanations, and step-by-step instructions, the book takes the beginner from building simple circuits on a breadboard to setting up the Arduino IDE and downloading and writing sketches to run on the Arduino. Readers will be introduced to basic electronics theory and programming concepts, as well as to digital and analog inputs and outputs. Throughout the book, debugging practices are highlighted, so novices will know what to do if their circuits or their code doesn't work for the current project and those that they embark on later for themselves. After completing the projects in this book, readers will have a firm basis for building their own projects with the Arduino.